We seemed destined to get here, didn’t we? Philadelphia AMP is one of the longest-running programs in the mixed division, pushing to the final at last year’s National Championship for the first time in their history. Washington DC Space Heater is in their first ever year as a team, pulling standouts from around the women’s and men’s divisions. This will be the third meeting between the mixed stalwarts and the newcomers, and we could not be more excited. The teams split their first two meetings, with Space Heater scoring the first victory in the AMP Invite all the way back in June. AMP got their revenge in the final of Mid-Atlantic regionals, winning 13-9 to wrap up the top spot in the region, and the number one overall seed at Nationals. However, the conditions in that second matchup were far from ideal. We have yet to see a match between AMP and Space Heater in ideal conditions, but with San Diego providing a beautiful backdrop for this year’s championship, the stage is set for a titanic clash. 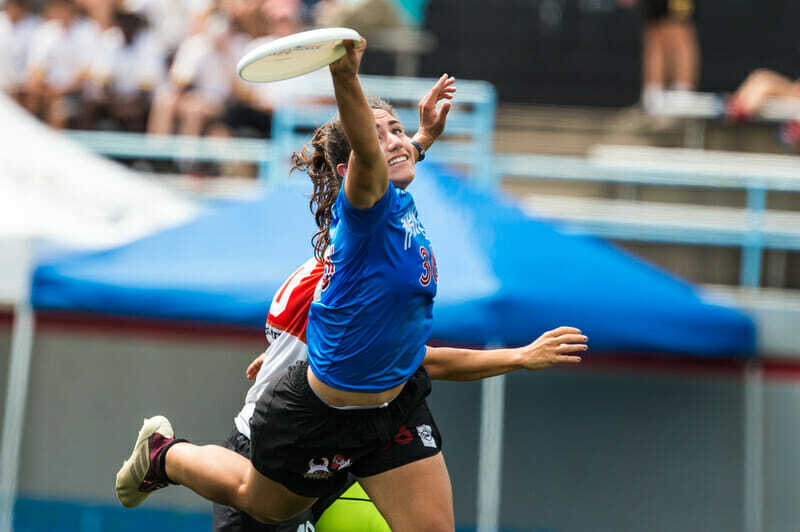 Between those two meetings, AMP won both the Boston Invite and the U.S. Open Club Championships, along with third-place finishes at the Pro Championships and WUCC, before an unbeaten run through Mid-Atlantic Regionals. Space Heater, for its part, had an uneven weekend at the Chesapeake Open in August before running away with Capital sectionals. Relatively untested before Nationals, Space Heater had the most question marks in the division, but they’ve stepped up and made good on the promise they showed when the team was first formed. Despite coming in as the top seed, it has not been smooth sailing for AMP. Strong wins early on Thursday were followed by a surprising loss to San Francisco Blackbird to drop them to second in Pool A. This set up a prequarter matchup with Boston Slow White, a game which AMP barely escaped from. Despite multiple break chances, the D-line offense was not able to close out a surprising Slow White team. Down 8-6 at half, AMP managed to break their way to an 11-10 lead before squandering several break chances to ice the game. Slow White had the game plan to disrupt AMP’s offense and force them out of their rhythm, and it nearly paid off. Following that game, AMP ratcheted up the intensity and blew away Minneapolis Drag’n Thrust. It was a completely dominant performance in the way their game against Slow White was not. The simple things that weren’t working against Slow White suddenly clicked; there were no more overthrown swings or floaty 50/50 shots. Led by the handling of Carolyn Normile, Nicky Spiva, and Sean Mott, AMP’s offense can be the most consistently excellent in the entire division. With so many points of attack, opponents cannot key in on a single threat, and the team’s cutters keep switching the field aggressively while stretching deep. Linda Morse looks to push the pace early and often, with sharp cuts opening space underneath for easy yards. One of the few teams to consistently play with a 4W:3M ratio, they have depth that few teams can match, and it put them in the driver’s seat for another trip to the final. Fitting for a team that has not had much time playing together, Space Heater spent much of Thursday trying to figure out who they were and how they were supposed to play together. Despite having some of the best female talent in the game, too often they were kept out of the run of play on Thursday. San Francisco Mischief won their matchup with Space Heater thanks to tight zone defense which forced a lot of inside-the-cup throws, and Space Heater was reluctant to throw around it to an unmarked Jenny Fey, or push the disc downfield to Claire Desmond or Georgia Bosscher. Sidelining the superstars proved to be enough to take down Space Heater in pool play yesterday, and Space Heater could not get out of its own way at times. Against BFG, there was a much greater emphasis on clearing space downfield and letting the stars show off. When Space Heater put the disc into the hands of Fey, she had the vision to unlock whatever defense BFG threw. The zones which had bothered Space Heater so much in pool play were suddenly ineffective, with Fey finding Bosscher, Desmond, and Pat Shriwise over the top throughout the game. Fey was unfazed by the windy conditions or the outstanding athleticism of BFG’s defenders, and her skill at finding the open player negated whatever pressure BFG could generate. All year, we’ve defined Space Heater’s potential based on the outstanding group of women on the squad, and after two days of play at Nationals, they are starting to understand the best ways to unlock that potential. Scary news for the rest of the division. With only a single game to play on Saturday, AMP’s depth won’t be as much of a factor. While that certainly helped them stay fresh Friday, despite playing an extra game, both teams will be rested and able to run out their top lines as much as they are able. Expect to see AMP run out Spiva, Normile, Raha Mozaffari, and Anna Thompson as much as possible, alongside heavy doses of Mott and Emily Shields. Keeping players fresh will be a key factor for AMP. If their stars can keep attacking, AMP is in a strong spot. Space Heater will counter with as many points as Fey, Desmond, Bosscher, Sandy Jorgensen, and Alan Kolick can play. Kyle Khalifa had a strong game against BFG as well, cleaning up the cutting set and wrapping up points where defenders were too focused on the star power of Space Heater. Shriwise will be an important vertical threat as well, and you can expect him to be on the receiving end of many a high stall huck. AMP has the history, the chemistry, and the talent to take this game and return to the final for the second straight year, but its impossible to write off the top-end talent Space Heater boasts. Expect a tight game from start to finish, and while AMP should prevail, it will not be smooth sailing. Comments on "AMP and Space Heater’s Regional Rematch on National Stage"